Deck building has never been easier with so many available resources to guide even an amateur builder. Sometimes, you may just be frustrated working with different contractors for your home improvement projects. If so, have you considered taking up the job yourself with the help of some DIY tips? One of the DIY projects you can consider is deck-construction. A perfectly-built, long lasting deck area is possible with a good plan at hand and some knowledge on building. It’s all about making correct progress in your project and aim to keep product waste at a minimum along the way. This ultimately reduces cost involved. Here are guidelines for you on how to build a deck. Simply put, constructing a useful and aesthetically pleasing deck area requires you to (1) design a plan, (2) purchase the necessary materials and tools, and (3) build! It is an open secret that all good structures require a building plan to start with. Determine the location of your deck- it may be positioned in the garden, patio or just outside your doorstep. Measure the area accordingly. If you are unfamiliar with plan-drawing, feel free to request help from someone else. Next, list down some of the tools and materials you’ll need. They include pressure-treated lumber or composite material (your choice of material for the deck), cement, joists, brackets, nuts and bolts, drill saw, level and measuring tape. These items vary in number depending on the design and size of the area. Having a good foundation is crucial. It is the central supporting system of the whole structure. You can position posts in the cement, and add beams and joints to it. Some local authorities have requirements on building this structure. Remember to consult your local authority. Next, install the main floorboards. They will cover up the “skeleton” area earlier on and you can also add handrails and stairs here. Finishing touches are added, where you paint or seal the wood. This ensures its prevalence against the harsh climate for many years to come. 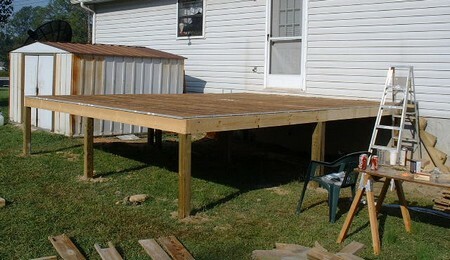 Ultimately, these steps are guidelines on how to build a deck. Consider the available time and experience you have, and match it to this project. The detailed plans can be found online or via many other resources. Customize the construction plan and modify to suit your idea. If you are a seasoned builder, there are endless construction possibilities for you to explore!